Each Major Championship has something unique to offer players and fans. The Masters has the tradition, the British Open has the links-style test, and the PGA Championship is exclusive to professionals in addition to the course layout being notoriously long. And then there is the U.S. Open. The second Major Championship of the year is upon us this week, as the United States Golf Association gets set to put on the 2014 U.S. Open from Pinehurst No.2. The U.S. Open is widely perceived to be the toughest test that players face all season long. The goal for the USGA is to have the winner set at even par. Compared to other events (even Major Championships) on the PGA Tour, having a winner finish at or above even par is quite the task these days. But the USGA has become the forefront authority for course layouts and pin locations designed to test every fiber of a player’s nerves and skill. 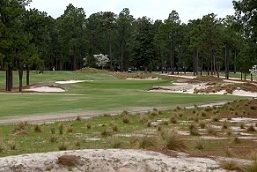 Pinehurst No.2 is hosting the U.S. Open for the third time in 15 years, but looks nothing like any of the previous two. The course will also host the U.S. Women’s Open next week on the LPGA Schedule, marking the first time the same venue will hold the championships in the same year. A complete overhaul to the course layout means that players will be playing a different U.S. Open at Pinehurst than before. For one, there is no rough. That has been replaced by sand-like conditions outside of the fairways. They aren’t quite bunkers, but it isn’t quite rough. Whatever it is, players will most certainly be penalized if they stray from the fairway. The problem is that there are a lot of Par 4 with the yardage starting with a ‘5’, and a par 5 starting with a ‘6’. That means that the golf course will be playing extremely long and players might be forced to hit driver on some of the holes if they hope to hit the greens in regulation. While that might tend to favor the long hitters, it won’t if they can’t put it in the fairway. U.S. Opens place a premium on hitting fairways, and this might be the epitome of that sentiment. But Pinehurst No.2 doesn’t let up after the tee shot. In fact, the course is most well-known for the turtleback greens that make it very difficult to hold. The greens have faded to the background because of the new look, but make no mistake this is where the tournament will be won. Phil Mickelson said earlier this week that he believes he has a great chance based on his short game alone. With the greens difficult to hold, it will place an emphasis on creativity around the greens and saving pars. Don’t be surprised if the winning score this week is above par. Players might have a tough time adjusting to the new layout with weird lies sure to happen in the sand. This entry was posted in Opinion and tagged 2014 us open, phil mickelson, pinehurst No.2, us open golf on June 11, 2014 by Bryan.